When a roof leaks, one of the first spots most roofers look at is around the flashing. This is because of the amount of water that runs by it. Poor flashing quality, or ill-fitted flashing can be a disaster waiting to happen. If you hire an experienced roofer, they will take the time to make sure your flashing is placed properly in the first place to avoid trouble later on. Perhaps just as importantly, you must keep an eye on these points over time to identify debris build-up or small perforations before they turn into major problems. Flashing is a building material that is used on the roof of a house. The primary function of it is to prevent water from leaking into your home. It also helps to avoid a backlog or buildup of water in the roof by directing water away from cracks or valleys. It forms a tight seal in the necessary places, so that when it rains, there will not be an intrusion of water into the walls. Flashing needs to be present at all roof penetrations. This includes joints, grooves, edges and valleys. Without it, the roof deteriorates to the point where it is failing to do its primary job in protecting you from rainfall. What Materials is Flashing Made From? The material used for flashing depends on what it is being used for. Sheet metal is the most durable material you can use but is also the most expensive. Copper and stainless steel are popular choices. Plastic flashing is the least expensive option but depending on levels of exposure to wind and rain it can wear down quickly. Composite materials can also be used to make flashing. Metal flashing is a popular choice for dormer windows. 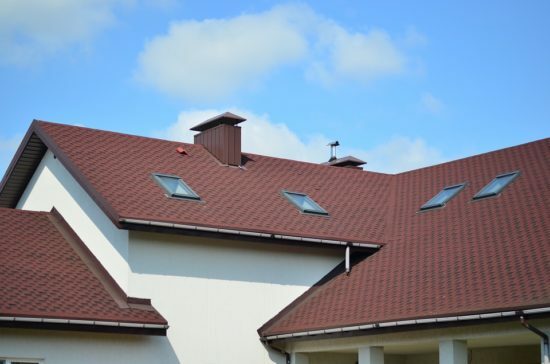 This process involves flashing squares being inserted into every row of roofing material. A strip of flashing is also placed around the edge of the window. The flashing that is placed around a skylight is one continuous strip. A wooden curb is used to raise the skylights and flashing is then placed in the gaps. A recommendation put forward by the National Roofing Contractors Association is that the vertical run is 8 inches. Hoods can vent either through the roof or the outer wall. The shortest venting option is advisable. After placing the new vent, the flashing should be slipped into the shingles. The joints are then sealed. A pipe vent is also called a pipe stack. The pipe flashing slides over the pipe so that it is extended 4 inches below and 6 inches on either side. The bottom part will overlap with the row of shingles. The materials for chimney flashing are usually metal or PVC. The flashing strips cover the joint between the chimney and the roof. They bend in the corners and are overlapped by one edge of shingles. Poorly constructed flashing, or flashing that has deteriorated over time can lead to devastating and highly expensive effects. Water from a single storm or a stretch of bad weather can wear away flashing and eventually disable its primary purpose. Water will leak into your home and could cause damage to your interiors, furniture and inner walls. A roof that destabilizes due to flooding or water damage can collapse and is expensive to repair once extensive damage has been done. For these reasons, flashings should be checked regularly by a professional and swapped out whenever necessary. Flashing is a critical element of any functional roof. Having this aspect of your home inspected is paramount to safety. You must ensure that your roof has flashing in all the right places and that the correct, durable materials are being used. This is just one of the elements of a roof inspection by our qualified roofers, so get in touch with us today. It could save you a lot of money in the long run!